1 New character piece. 2 New Environment pieces. New section entitled Graphic and Web, with it's first 2 contributions. I'll be posting more soon. Check back! 1 New collection of character work. 6 New pieces in the environment section. 2 new life drawings from Dr. Sketchy's Anti Art School in Vancouver. And here for perusal: It's the successfully optioned Rosenpig Concept Pitch Pack! Ok, it's now the year 2009. The future, since I last posted here. Happy to report that we're all wearing silver jumpsuits, and I've been working hard as a concept artist at Nexon Humanature studios. I'm unable to post any of the work I've done in the last year and a half. I will assure you that it's by far some of the best stuff I've ever done. I've had the pleasure of working with fantastic art direction, and been surrounded by great talent of all sorts. Never have I learned so much. For now, I'll update with a smidgeon of art from my lifedrawing outside of work, and fun side projects. It's been a while since I updated the news page here, but I've been pretty busy with other pages, like our flickr and my new blog. I decided to kill the links page here since it's so hard to maintain. I've converted to delicious, so you can check out my bookmark directory instead. Friend links here. Just retitled the Animation Section to Character. Now its all about character design - anything thats more environment related goes in Background. Lots of Concept work in both sections though. Two new Rosenpig adventures have been created, and they're my favorites so far. Those will be up on the Rosenpig site as soon as their new owners have received them. Remember - 50 dollars CDN gets you a lovely hand made Guinea-pig and an original, unique, painted, adventure cartoon! These prices won't last, I can promise that much. Lots of news: Have been animating on Pucca - the show looks fantastic. The "Second Son" Video for Elliott Brood has been played on The Wedge, Much Music's one and only time slot for actual music. This is great, and I've heard it's also been playing on Much More, possibly the Country one too. I'll soon get a new resume up - with industry experience! Will be looking for work in vancouver this summer. For now - up to date contact info, up above. Kapow!! Artwork from the upcoming Elliott Brood music video: "Second Son"
Look for it in BG, and Animation. Two life drawing that escaped posting earlier too. My to do list for updates is still long. Hub page... Transit drawings... etc. I'm on the case though. I recently started working on the Studio B series PUCCA. (Vooz property - very cute) With moving to vancouver, being forced to learn flash and finding new stuff for my pad I have been very busy. I will try to update monthly again now that I've got my computron. A thoughtfully laid out index page to navigate through the different websites here. And for now? Slightly improved colour schemes here and in the archive... and a new ROSENPIG ADVENTURE! 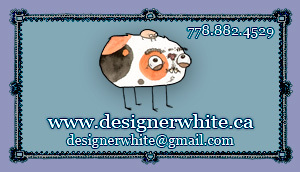 I'm still in the process of recontructing the website, if you haven't noticed, designerwhite.ca has become a hub site for this, my Art home, Rosenpig, and an archive. The archive is a place to put old news posts, when there get to be too many, as well as ridiculously old artwork, etc. Currently I am directing a Music Video for Elliott Brood and will be able to post some artwork from that after the video is released, hopefully the end of september. New section: Portfolio - my throwaway portfolio here. 1 New observational - (sharbot lake cottage.) I'm planning on turning this url into a hub for the Art page seen here and the Rosenpig website, and throwing the old news posts into an archive, which will also feature my highschool and fundies artwork. (It's for myself that I keep it around, so I might as well tuck it away.) Rosenpig has been updated! Movies! Animation! Super fun! Big news for the site: A sister site devoted to Rosenpig has been created. Rosenpig's Webworld!! In the coming days, expect many updates, including information on how to buy these adorable creatures. A slew of artwork from the final quarter of sheridan animation is coming as well as my film, which I have been touching up a bit lately. Many thanks to my musician - Andrew Pants of Songstowearpantsto.com who, as you will soon hear did an excellent job with the audibles. Added some old digital paintings, a dragon in BG, and a painting of my sister's friend in Life. 5 new 2 page spreads in transit. 2nd Semester Lifedrawing here (first installment). Costume and character, yay! A new painting of my Childhood residence, in OBS. Robots in Animation. 5 Rosenpig layouts in BG. More Transit drawings to come, soon. Oh yes - I rarely update my links page, but let me know if you want to be added. A NEW SECTION: Transit. Part of the Bobby Chiu subway group drawings (+other travel drawings, in chronological order) Meet us in T.O. at the Union platform, every sunday around 3:10 to 3:30. Also Posted some old 1st, 2nd year work in animation. Sherlock Holmes as a bug, Chow Rowland mouth shapes, and sword designs. The first batch of 3rd year life drawing (first semester stuff) has arrived. I've got better stuff on the way; 2nd semester has shown much improvement so far. I also got back to the U of T morgue and painted another disected face - in obs'. Posted the Design-pack work for my film: "The Grand Adventures of Rosenpig" It is the story of a time traveling guineapig. I will post new life drawing and some actual animation in the next few weeks. A fair deal of new Winter Fair paintings posted in Observational, and a desert thing in background. Added some new links, also. Working on my film now, hoping to get some actual animation up over x-mas. Updated links. Let me know if you're missing. I added some animation character work - Brittzlebuster the Space explorer, and Chow Rowland stuff, which I worked on with Kareem (check out his page in links). Also the 2 part Goblin project, and a dino in obs'. Best of all though, the story of my intestines has been told in art form, under About me. Added a link page. Feel free to link to moi also - banners available. Spiderman 2 was soooo good. Updated Life Drawing, Background. Still need to get to Character work in Animation, and get a link page for all my talented peers. (next few days) -email me your webaddresses, friendses. Posted a lot of observational. Re-sorted into the 4 main categories: Animation (+character work), Background (paintings + layout), Life, and Observational (animal, scenic, museum, etc.) A lot of work still coming. -Shrunk down the fundies thumbnails, did some major reorganizing, and finally got new lifedrawing and artwork up. Have yet to fill the portfolio, and still need to scan or photograph some work from the past 2 years. I have a lot of watercolour studies coming, and some time soon, my 2nd year animated lip sync project: "The Adventures of Mouth Man." Finally my website is up again after 2 years down. It still needs a severe updating however. (Which I'm on top of.) Good luck to all 3rd years on film ideas. I'm looking forward to them all.